Fräsch’s funky furniture designs and a special attention to absorbing noise pollution completely transform the look and feel of office spaces. Fräsch means “fresh, cool, and modern” in Swedish and it lives up to its name with innovative designs that make an office space look fun. Every piece is multifunctional with eco-friendly fabric that absorbs noise and furniture that can be adjusted depending on the situation. Made in Dallas: Dallas Innovates spotlights interesting new products from Dallas-Fort Worth innovators, large and small. Know of something notable that’s made (or conceived) in Dallas-Fort Worth? Let us know. Husband-and-wife team Gary Nightingale and Slavi Younger didn’t want to just sell a commodity. They realized that they were a dynamic business duo, and with Nightingale’s background in sourcing products and Younger’s background in marketing, soon found themselves creating Fräsch. 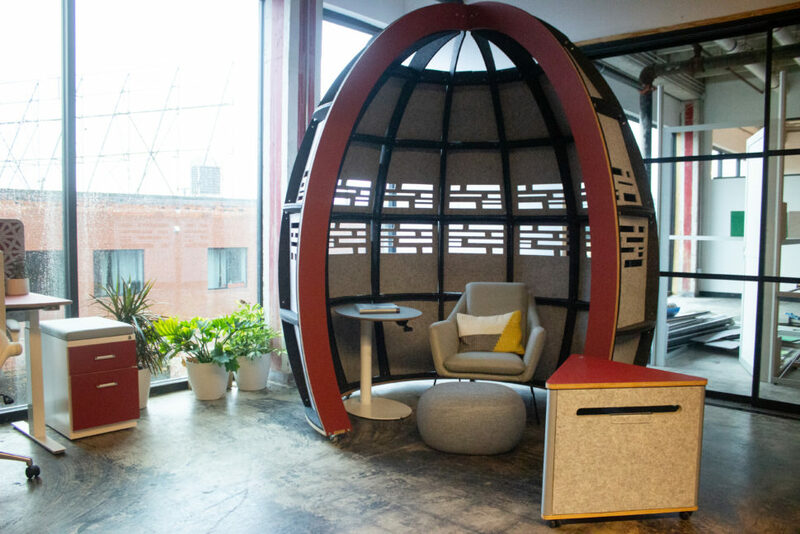 Steve Kinder, who co-created coworking company GoodWork, joined Fräsch last year as a co-owner, bringing with him a background in furniture manufacturing. Although most of Fräsch’s operations are based in Grand Prairie, it has a showroom in Dallas that shares a space with GoodWork. 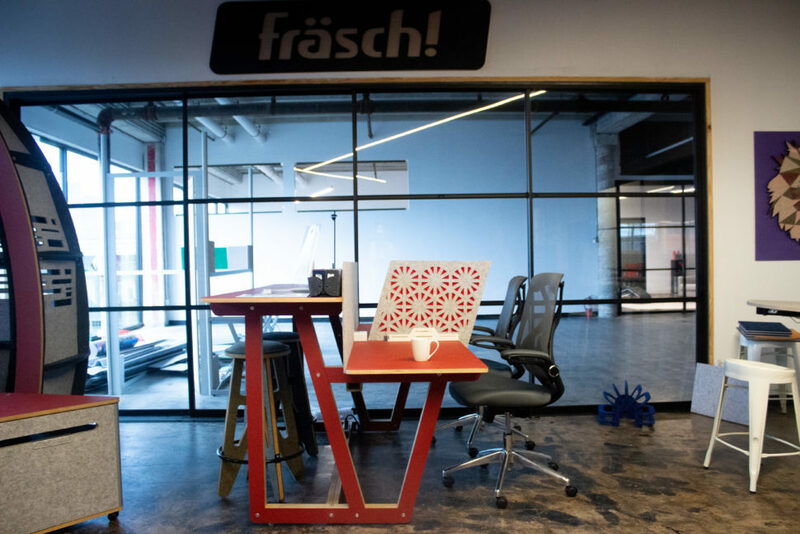 This has created an unlikely collaboration in which the coworking company is able to try out Fräsch’s newest products, while providing Fräsch with feedback. One of Fräsch’s endeavors is its partnership with the University of Texas at Arlington, where it recently signed on as a consortium member. Fräsch’s owners are lending their furniture expertise to UTA’s architecture department by helping the university revamp its furniture class and revamping the classrooms themselves. This relationship is more than just business — Younger actually attended the university, making this a full-circle experience for her. Although the roughly 5-year-old Fräsch has worked with major companies including AT&T Inc. and Dell, it really wants to be the company that small businesses come to. 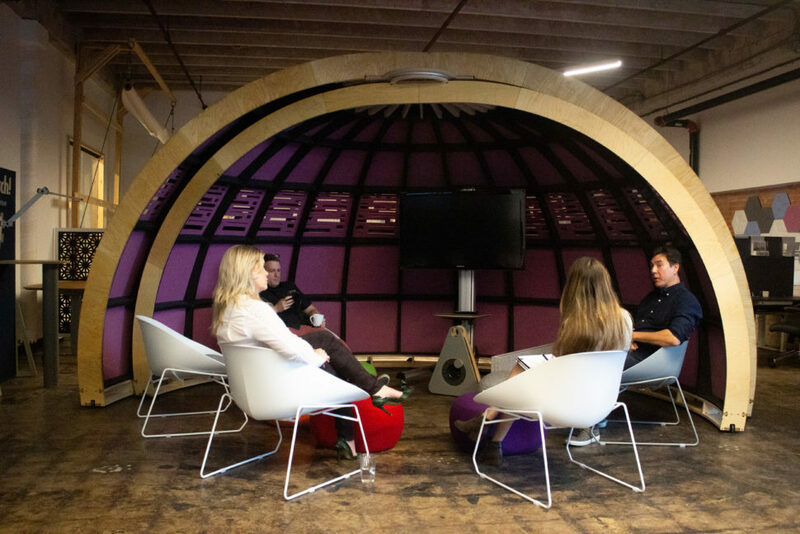 Along with the UTA partnership, Fräsch constantly is branching into new projects, looking into lighting and ceiling acoustic solutions, along with possibly taking its furniture worldwide. Whether it be through design innovation or unique partnerships, Fräsch is always looking at what’s next. You can shop Fräsch furniture here. Dallas Innovates took a tour of Fräsch’s Dallas showroom, capturing all the details of our latest innovative space. 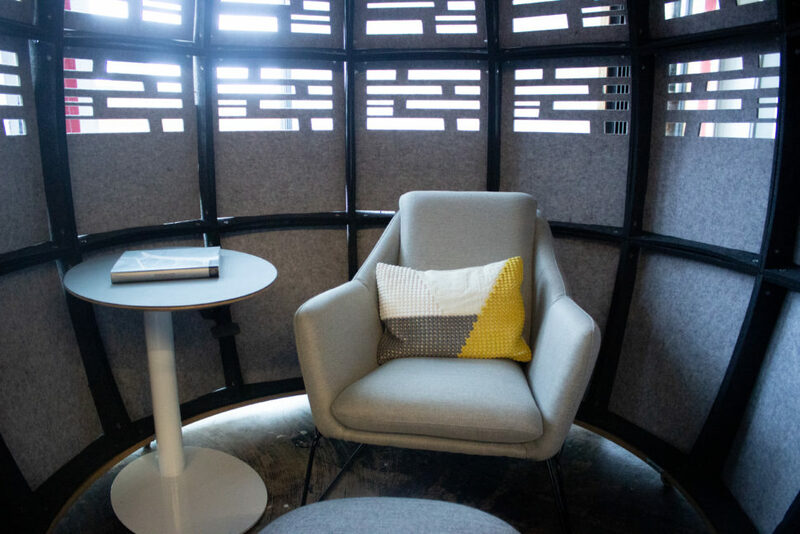 This egg pod allows employees to have a quiet place to work or relax. 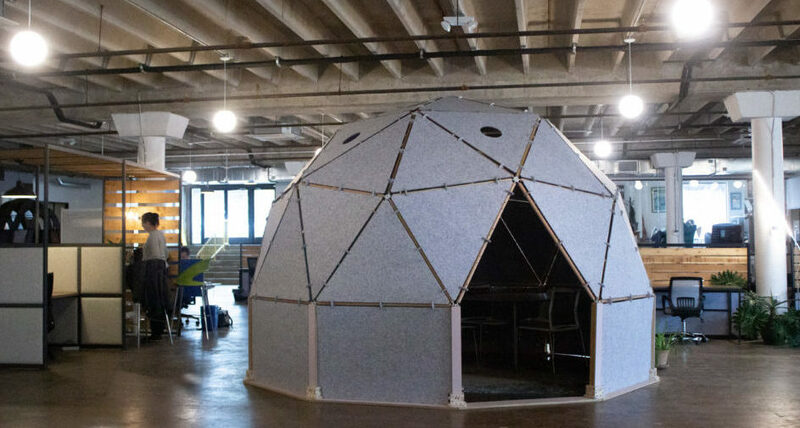 The dome is part of the company’s signature style. Individuals can use this desk to sit or stand while working with its multi-level design. 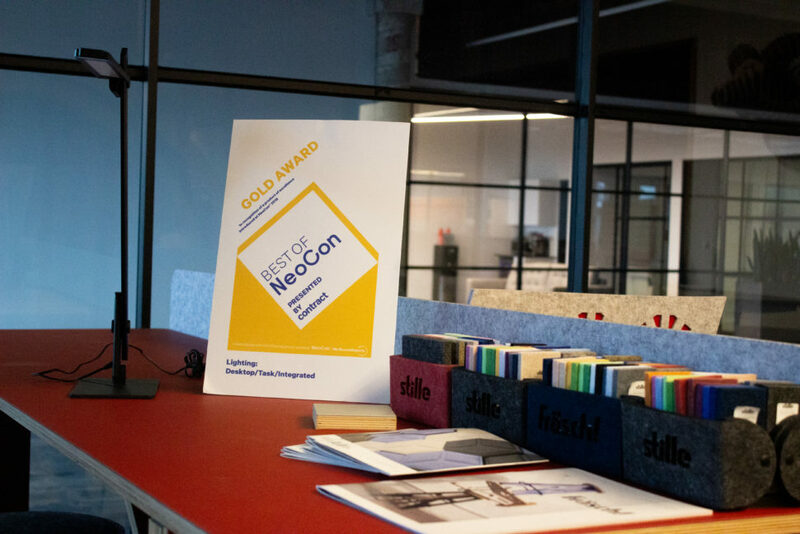 The small business has already won a couple of awards for their innovative products including a Best of NeoCon Gold award along with the Interior Design Magazine’s HiP award in the Technology category. 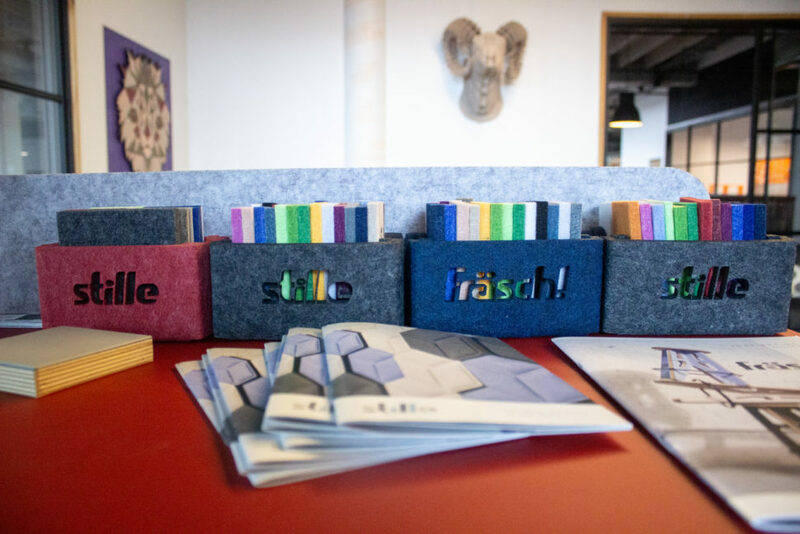 This recycled fabric is a basis for Fräsch’s noise-absorbing furniture.The Fräsch owners are serious about acoustics. So much so that they created a sub-brand called Stille, which specifically focuses on creating acoustic panel solutions. These acoustic wall tiles in particular have recently received praise from Interior Design Magazine for being able to absorb noise pollution, while also functioning as a Bluetooth speaker. 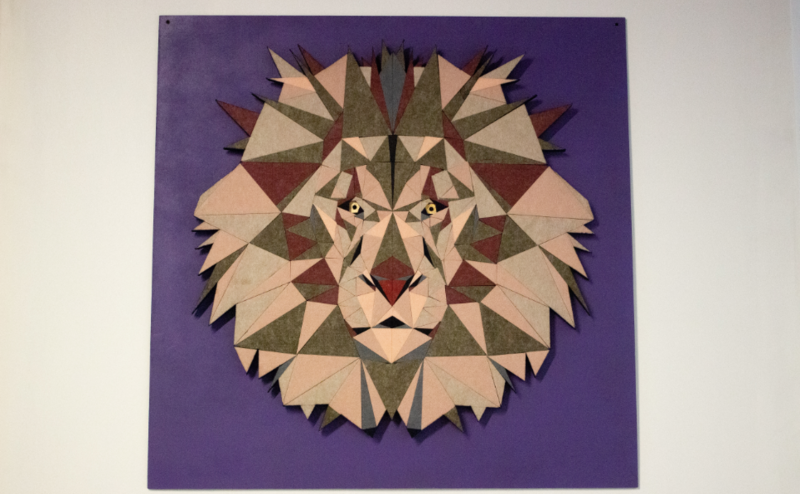 Even this wall art is multi-functional as it is made with noise-absorbing material. 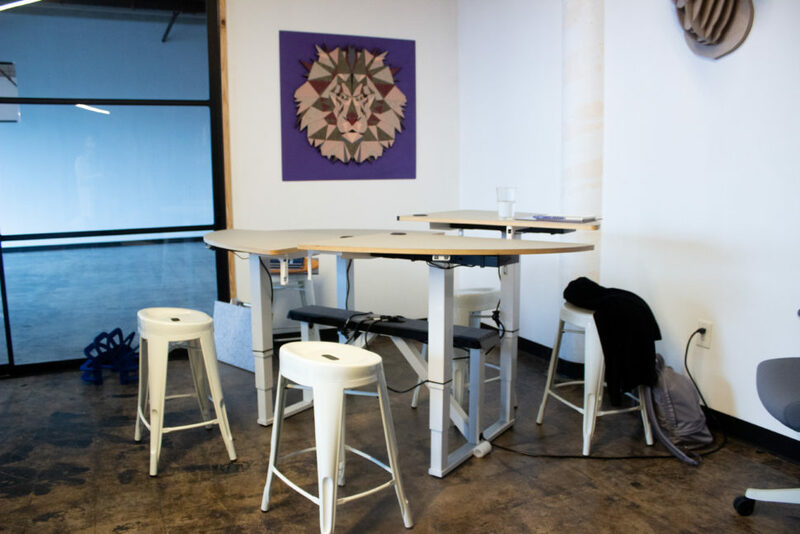 Although this desk is meant for multiple people, everyone can feel comfortable with its individual adjustable parts. You’ll also find Fit Factory, The DEC @ Redbird, BayMark Health, and Blue Racer Midstream in this roundup of investment, merger, and acquisition activity by investors and companies with ties to North Texas. Millennials and centennials ask for an elegant, connected buying experience. Bottle Rocket is helping big brands win with connected customers. How Dallas-Based CFJ Manufacturing's president streamlined its vendor management process and tackled tough problems The Toyota Way.